In this episode, Kari and Yolei fall into a rough spot and end up getting a bit physical with each other. Aww yeah. One of the criticisms about the DNA evolution arrangement is how the characters are paired off. Once you get past Davis and Ken, it would seem like the obvious pairings are TK/Kari and Yolei/Cody. After all, both have formed close friendships that have existed well before this mess started. If anyone's seeing eye-to-eye on this team, those would be the choices. Unfortunately, given the obvious comparisons, having DNA evolution between a boy and a girl is problematic. So we're stuck with Kari/Yolei and TK/Cody. Still, when life hands you lemons (or, for fanfiction enthusiasts, denies them), you make the most of it. There's actually a nice symmetry to this arrangement. Since none of the pairings have that prior history to fall back on, there's an added level of difficulty involved, especially since each pair has occasionally been at odds with each other. While the relationship between Yolei and Kari has never gotten a lot of attention, it turns out that's because they're two girls that really wouldn't hang out with each other if not forced into saving the world together. This episode not only clarifies their opinions of each other, it is downright diabolical in putting them in a situation that brings the absolute worst out of them. Kari's held as this perfect being of light, but Yolei's uncertain about her, recognizing her unspoken fears and hesitations... and possibly the whole “manipulating Davis like a cold-blooded shrew” thing. Kari, meanwhile, doesn't think much of Yolei's outspoken behavior and tendency to run her mouth off. So they end up getting trapped in a phase warp with Ken, where he and Kari are unhinged by the forces of darkness and Yolei's on edge and constantly saying all the wrong things. This combination is fantastic as Ken and Kari are both easily swayed by the darkness. They find a small bit of reassurance in each other, but this isolates Yolei who is just not used to this sort of thing. She's the first to completely lose it, prompting Kari (yes, KARI!) to slap her across the face. Kari immediately apologizes and talks about how she's kinda jealous that Yolei is so open with her emotions... even when she needs to get slapped for them. Her response when Yolei insults Ken's bravery with several allusions to his Emperor days is a fit of giggles. Seeing the Dark Ocean again is a welcome sight, particularly the connection it forges with Ken and Kari. It's strange how little attention their relationship gets, as they can take a good deal of comfort in knowing they aren't alone in this. Ken has already succumbed to the darkness once and is trying to escape it, while it's eating away at Kari and she fears she can't fend it off any more. You'd think these two would be first in line for a joint therapy session. Instead, it's Yolei who comes through when the darkness overwhelms Kari in a critical moment. As it completely paralyzes Kari and she goes into a panic attack, Yolei slaps her right back, assuring Kari that she's one of the strongest people she knows and only being targeted by the darkness because she's their natural enemy. It's one of the most intense moments in the season. It kinda has to be to get these two to synch up well enough for a DNA evolution. 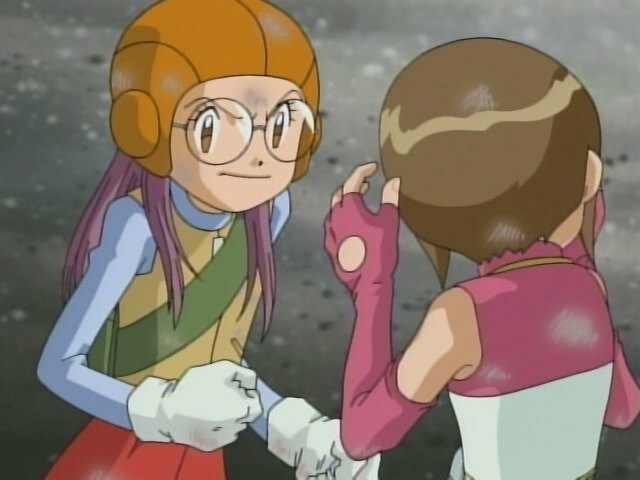 It's strange that for all the rivalries between goggleheads and assorted “rival” characters through the seasons, there never seems to be any disagreement between the girls. Sora and Mimi got along fine and Rika is surprisingly friendly with Jeri. You'll have to wait until Akari and Nene to get anything close to this. So even if it's only one episode, the one moment of Kari/Yolei friction stands tall, beaming through the sky like a beacon of darkness. The talk of trying to sort out DNA partners has Gatomon calling all the In-Trainings “young and inexperienced.” If you know what I mean. Arukenimon pulls a classic Demidevimon moment where she acts despite her cause advancing farther by not doing anything at all. Her sending Blossomon into the phase warp unwittingly brought on this DNA evolution and provided the doorway enabling their escape. Had she just drove on by, it's entirely possible that they would not have found a way out and Dragomon would have eaten all three of them. There's something about the phrase “I want to go home” that, when delivered in a certain way, hits me harder than just about anything. It defined Kari's breaking point here, and I've always felt the way she and Takato say it in my fanfiction series are among the saddest moments in the first book. TK tries to express how concerned he was about Kari getting sucked into the other world. At first, Kari's startled by him, then shrugs it off and says he doesn't need to worry about her because she has Yolei. Cold-blooded shrew indeed. "Unfortunately, given the obvious comparisons, having DNA evolution between a boy and a girl is problematic. " Not that it mattered. Never mind the fact that DNA Digivolving isn't really about what you're implying anyway, Gatomon would have been paired off with a male Digimon whatever pairing occurred. Fair point. Hawkmon's male, so the ones actually doing the DNA Digivolution are of opposite...oh, wait, that's right, Digimon don't actually have genders. We learned that in Tamers. 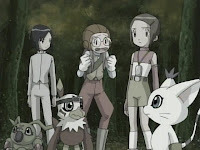 We also got an actual merged digivolution that involved the humans both male and female in Frontier: Susanoomon, at least in the final episode. (When he first debuted in episode 48, only Takuya and Koji were involved.) 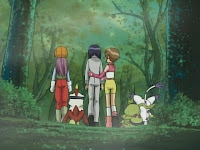 So, um, 4 guys and 1 girl (remember, Koichi wasn't there anymore). If we're really making the comparison to human sexuality, there are some really unfortunate implications behind that one. I agree with Anonymous above. I cannot see any relation between human sexuality and DNA Digivolving. It's just a fancy name is all. What I find the most disapointing about the DNA Digivolutions is that they limited themselves to just three pair ups. Why not crosss the streams so to speak. Ken and Davis, but also Ken and Kairi. Cody and Yoli, Yoli and Davis etc. 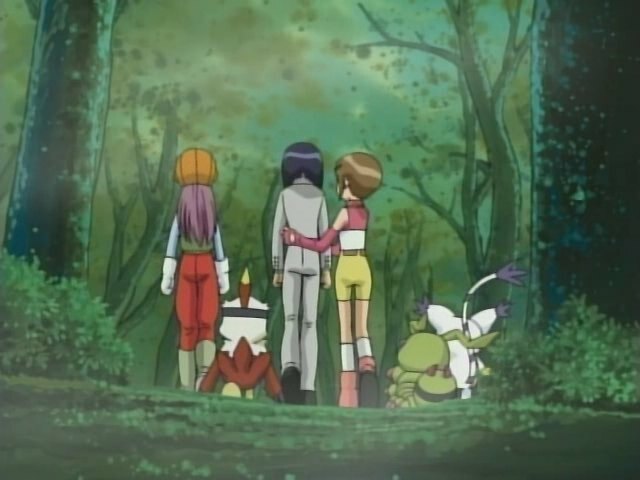 Even if it results in only one or two of the Digimon having only a single appearance, it would have been great to speculate about (as episode counts and unfitting character relationships would enevitably mean not all of the dozen plus possible combinations would be shown). 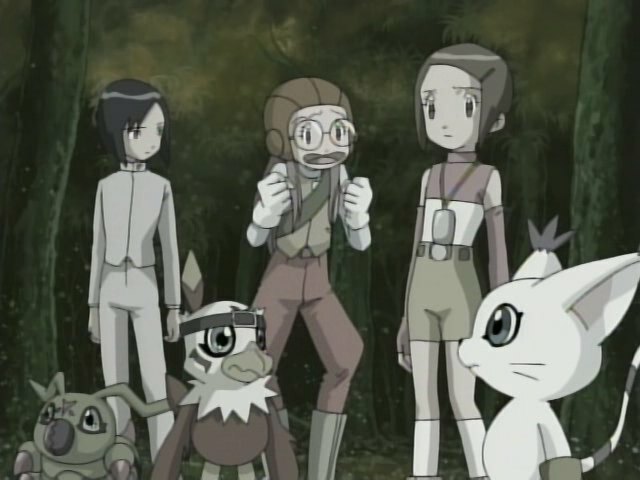 This was the Ultimate level for the show, it's just creatively shooting yourself in the foot to only show half as many levels as you have Digimon. I watched ep. 50 only twice and then I decided to skip it due to the stupid end and stupid epilogue.